SAP Query enables data from multiple tables to be extracted in one report, as long as at least one field of data can be linked from one table to another e.g. by Document Number. Unlike table browser (SE16), reports from SAP Query can be saved. You will need the required tables and fields before running SAP Query (if not known, refer to the list of tables PDF within the Data Extraction section). 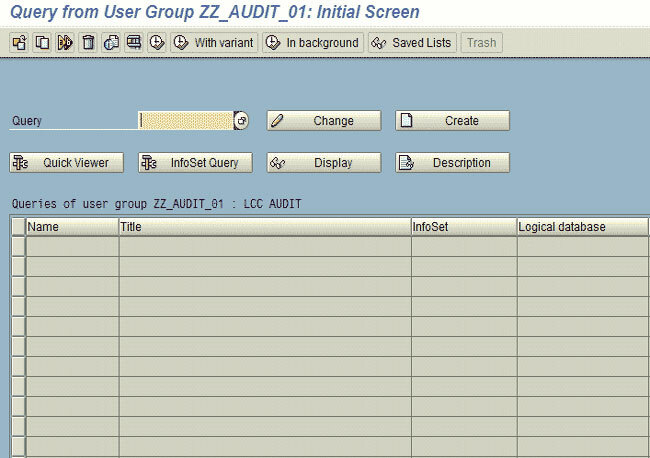 The next screen enables new reports to be created or saved reports to be run or amended. Note: The Help topics at the bottom of the page are referenced to the SAP Library on Internet Explorer. In this example, we are creating a report to show all vendors for a particular Company with name, address, payment method and bank details. Note: A query will only work with actual tables and some e.g. BSEG are too large to work with. The system will let you know if it cannot work with a specific table. When this happens, logical databases should be used instead. These can be identified using transaction SE12 (See separate instructions). Enter a name for the report in the Quickview display box. Enter a meaningful title for the report in the new box that has appeared. If more than one table is to be used then select ‘Table join’ from the Data source box. Select ‘Basis mode’ then, click the ‘green tick’. On the next screen, click ‘Insert table’. To avoid resorting fields later, tables should be entered in the correct sequence.In this example, we will display the Company data then the Address data and finally, the Bank data. Click ‘Insert table’ again and enter the next table (LFA1). Enter the last table name (LFBK). This shows all available fields within the selected tables and all the links between them. In this instance there is only one link between all three tables and that is the vendor number(LIFNR). The links need to be checked as sometimes they are not correct. Right click on the line and select ‘Display join condition’. Both fields should be the same (apart from the numbering). Right click on the line and select ‘Remove join condition’. Click and drag the field from the left hand table to the corresponding field on the right-hand table and release. Once the tables and joins have been set, click the Green ‘Back’ Arrow.The following screen should be displayed. On the left-hand side are the tables selected. The right-hand side shows the available fields for selection/report layout. As the link to vendor number has already been made, this field only has to be selected from one of the tables.Likewise, for other fields that appear more than once, they only have to be selected once, for where they are to appear in the report. As each field is selected it appears on the right-hand side display when this process is complete click on ‘Execute’. The next screen enables the selection criteria to be entered. If this is not as expected then go back to the previous screen and add/delete selection boxes. Click on the options icon in the ‘Output format’ area to display all available formats. ‘Spreadsheet’ is the preferred option for downloading to IDEA. If the report is too big for this, an error message will be displayed and either ‘SAP List Viewer’ or ‘Display as Table’ can be used instead. Select ‘Table’ and Green tick. ‘Green tick’ the next screen to run the report. A spreadsheet titled ‘Worksheet in Basis (1)’ should be displayed. Click on File, Save copy as…..
Rename the file and save in the SAP download area (it’s a good idea to create a specific folder in your audit directory for this purpose). To run or change an existing query, click on Quick Viewer. Click the button to the left of the required query (to highlight it). Click ‘Change’ to add or remove display/selection fields. Or click ‘Execute’ if changes are not required to the fields. This takes you to the selection screen. Selections can be entered and the report runs. Yes I also watched that you haven't provided the transaction where to start. Are you sure that the T Code isn't SQVI. Then when it is created you can transport it to SQ01 for other users. hi i am a sap basis consultant and want to know the directory interface between os and sap and oracle step by step,please tell.